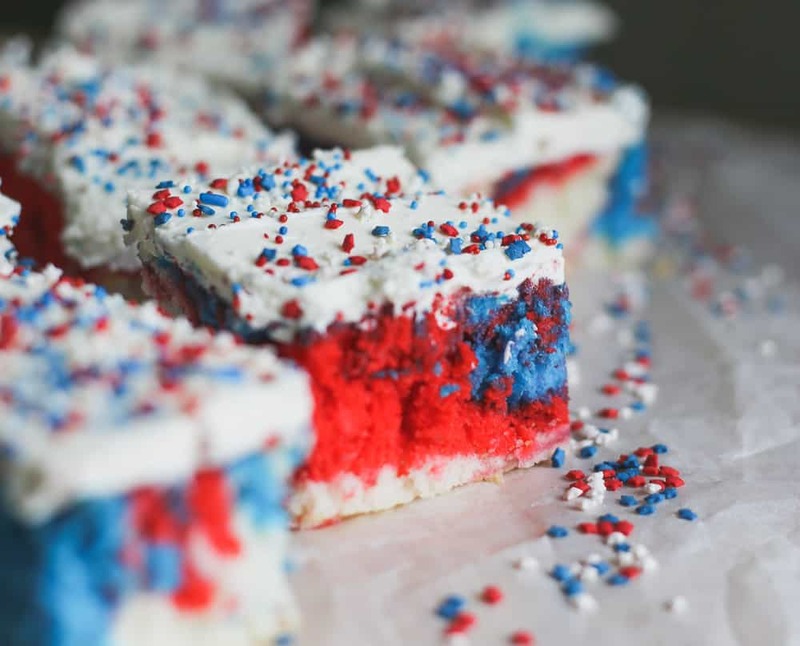 Rock out this 4th of July with this festive, Retro Red White and Blue Explosion Cake!! Doesn’t it look so awesome? 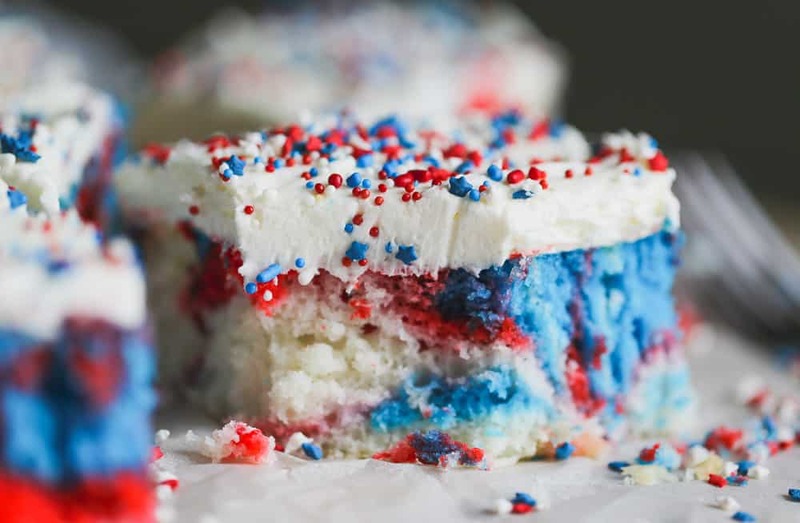 The vibrant colors literally explode with the red, white and blue tie dye effect, marbled in a light and fluffy vanilla white cake. 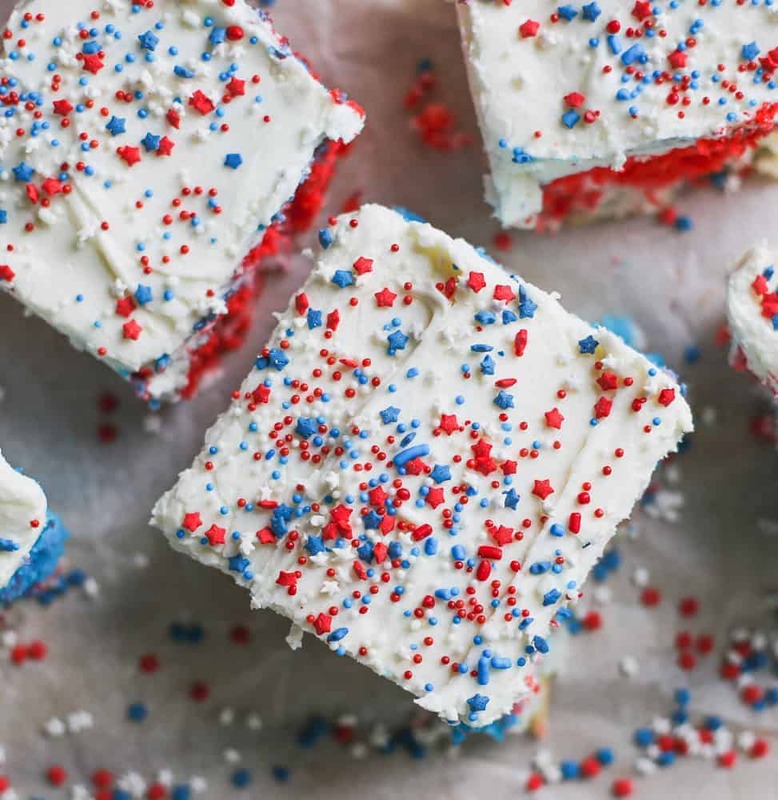 It’s topped with a super creamy, vanilla buttercream frosting and pretty patriotic sprinkles and stars. 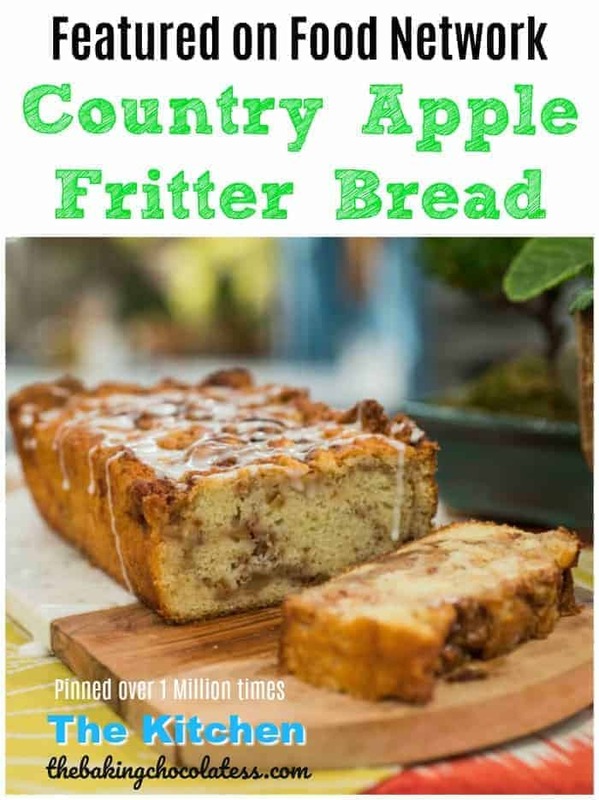 It tastes really yummy, baked in a 9×13 pan and is perfect for the 4th. 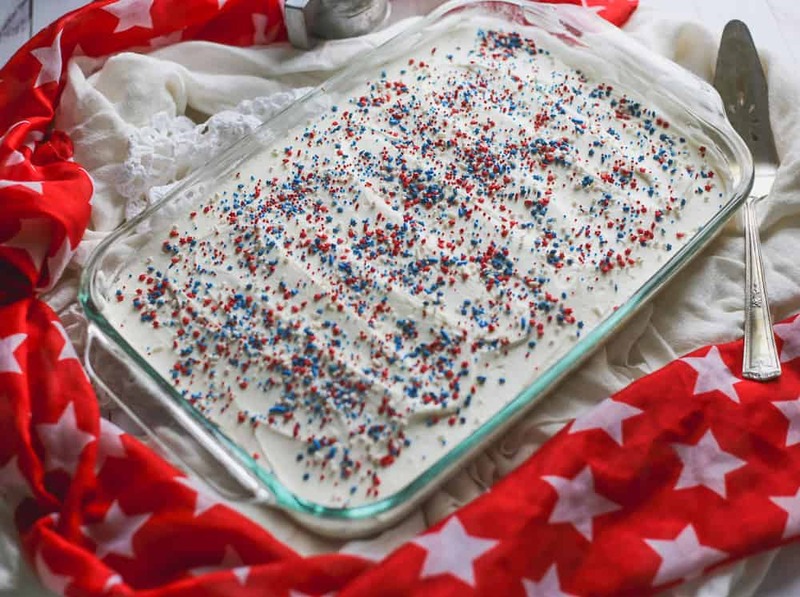 When I think of tie-dye, I think of peace, love, freedom, free-spirit, mellow, hippies, hipsters, coolness and the nostalgic 60’s & 70’s mostly, which ties in with the retro American theme of this cake! 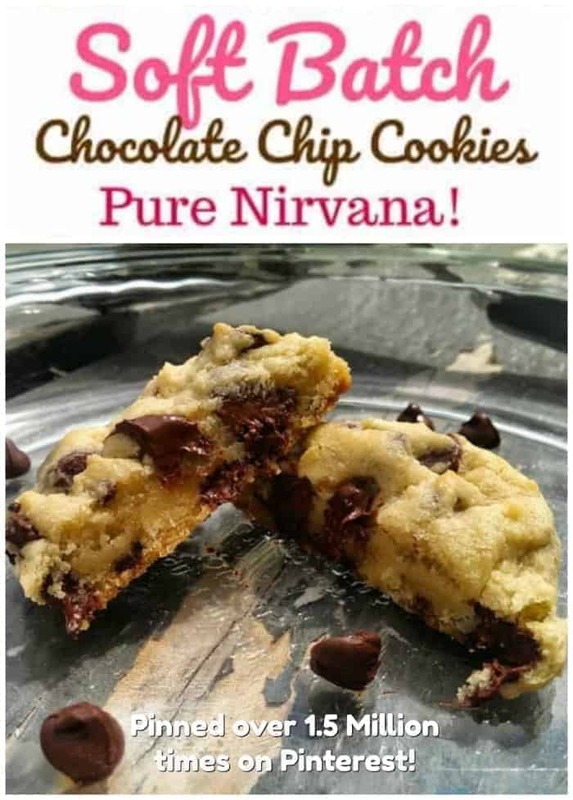 Amazon links are used on this post, see my non-disclosure for more information. So. Now…Have you ever made a multi-colored cake? It’s not hard at all, but to get bright colors in the cake batter, it’s better to use gel pastes because they are highly concentrated so you don’t have to use a lot to get awesome results. 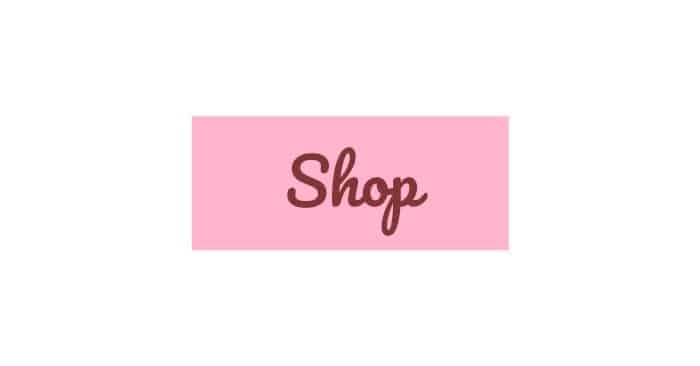 I really love using this 12 Color Cake Food Coloring Liqua-Gel Decorating Baking Set and it’s very affordable. For the cake, I took a shortcut and used Pillsbury’s Vanilla cake mix . I always find their cake mixes to be my favorite to use, when I’m not making a home-made version. You can of course, use your favorite frosting, bought or made, but I love to whip this easy frosting for cakes and cookies all the time. It’s so creamy and tastes amazing on about every dessert. It’s one of my favorite frostings ever! 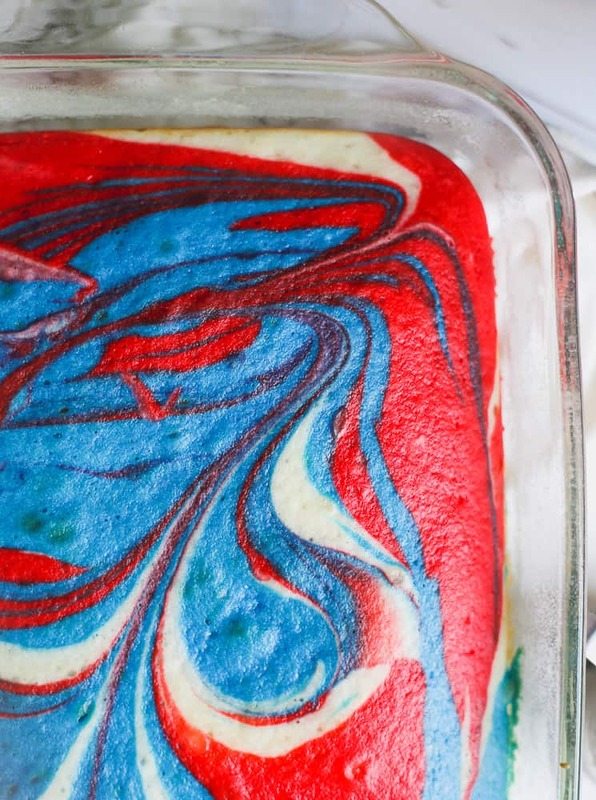 So more about these psychedelic swirls of our nation’s colors…the red, white and blue! To get the tie-dye effect, all you do is make the cake batter and grab 2 bowls and pour 1/3 of the batter into each of the bowls and add red gel paste to one and blue gel paste to the other and mix them up until you get the color you want to achieve. 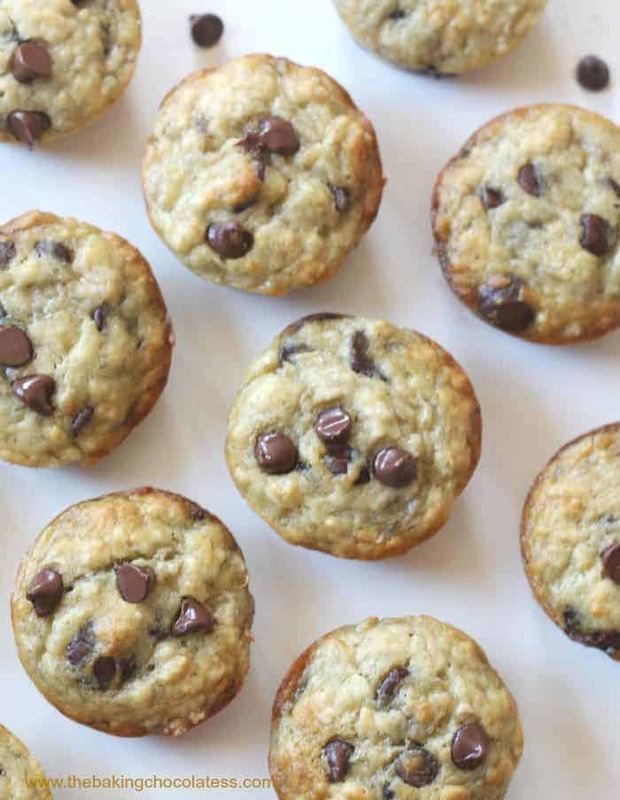 The color is pretty true when you mix it up and will bake the same color you make it before baking. Pour the white cake batter into the pan and then pour in the other colors, by randomly pouring them however you want with the white batter. The less you swirl the the batters around the better, once all poured in, is best, but you can give it a few swirls. Otherwise you’ll get other colors and you want it to stay red, white and blue as much as possible. 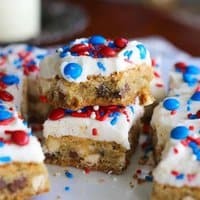 Need other red, white and blue party desserts, check these 4th of July – Chocolate Dipped Peanut Butter Cup Double Stuffed Oreos out, these Red White and Blue Chocolate Chip Bars and these 20 Red, White & Blue Patriotic Desserts to Proudly Hail! 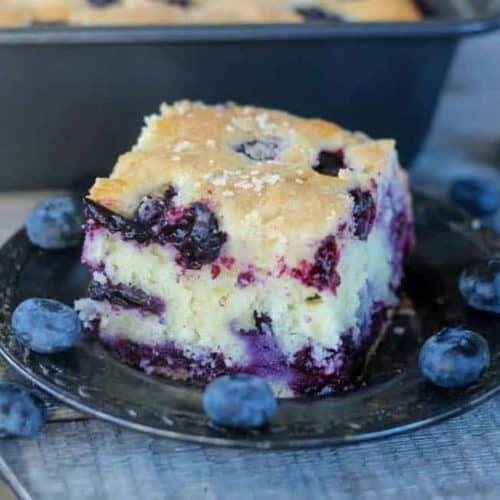 Make vanilla cake according to box instructions, then evenly divide your cake batter into 2 other small bowls, keeping the vanilla in the original bowl you mixed it in. Use red gel paste in one bowl and blue gel paste in the other bowl and mix until color desired. Pour the white cake batter into a 9 x 13 cake pan, sprayed with non-stick spray. 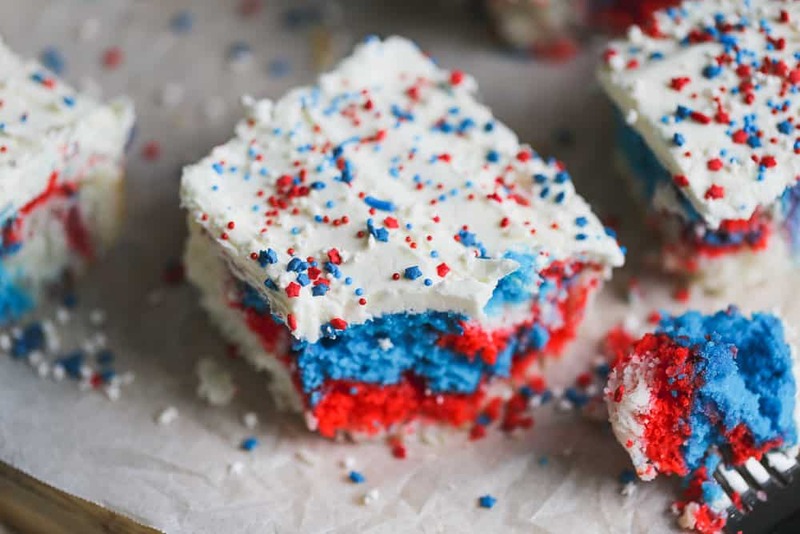 Then add the blue or the red by pouring on top, then swirl with a knife a few swirls, but not a lot, or you'll get other colors and it won't be red, white and blue. Bake cake until done and let cool. Once cake has cooled, make the frosting. Cream butter for a couple of minutes and then add in the powdered sugar, milk, vanilla, salt until smooth and creamy. 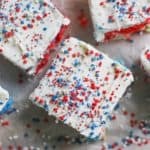 Frost cake and sprinkle some sprinkles on top and serve. LOVE IT! I’m all about a colorful cake, especially one made with a mix :). This is so perfect for the Fourth! This is sooo pretty, Kim!! I love the swirls! Plus, you gotta love a cake called “explosion” cake! 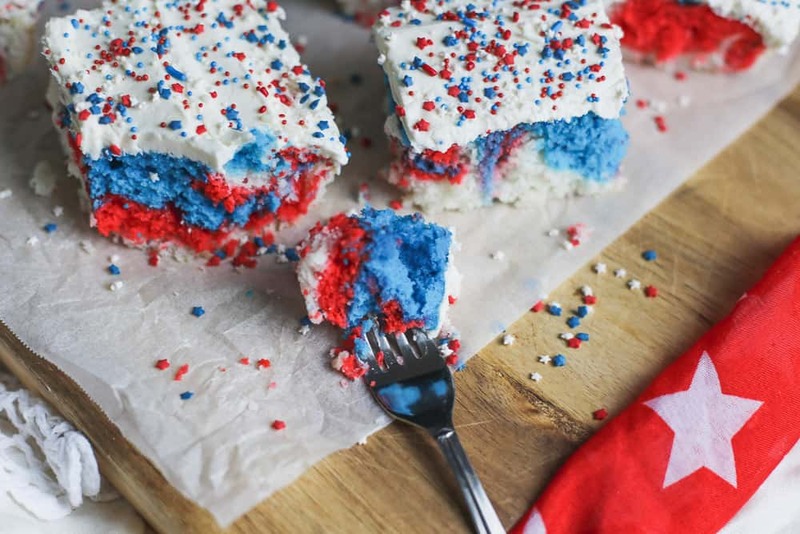 There’s nothing like a festive cake for the 4th! And this one is gorgeous! I love the tie-dye effect! 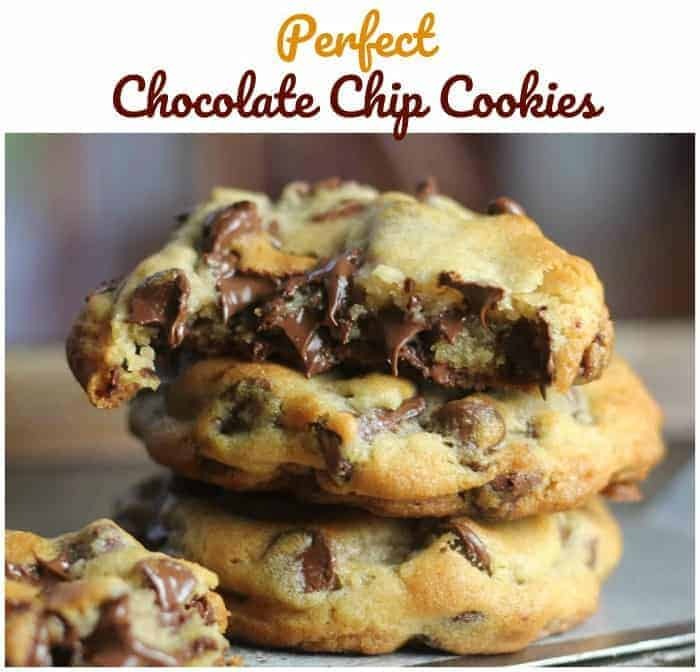 Pinning this recipe! Thank you so much Laura! I think it’s so fun. So easy Kelly, and thank you so much!